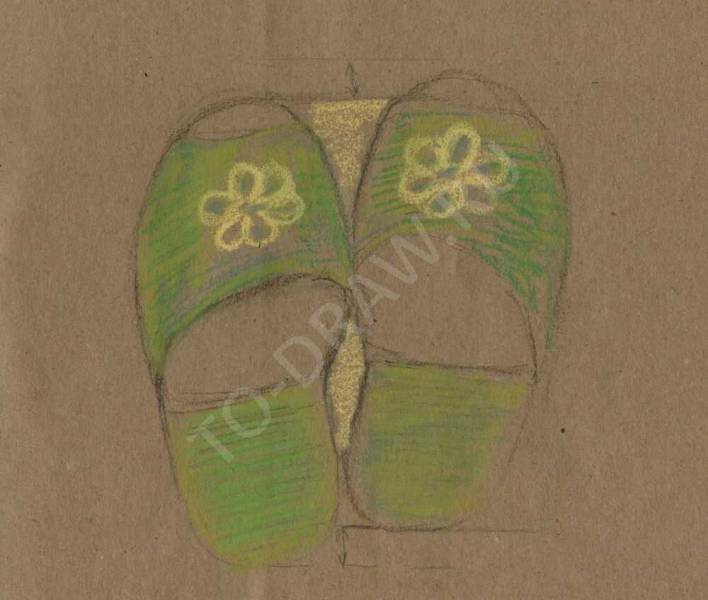 How to draw step by step pastel slippers? How to draw Slippers pastels? Just today we will talk about it. Pastel drawing very quickly, unlike, for example, from pencils, as can the side face of the chalk immediately to close large areas of work. But pastels there is one drawback - it is very easily soiled. So at the beginning of working with pastels, you need to carefully prepare - prepare dry and wet wipes which you will be able to wipe his hands in the process of drawing, if You will blend with your finger, and this is in my opinion, the most convenient way. In this work we worked not only with crayons and pastel pencils that allow more fine lines. If You are still unfamiliar with pastels, it is best to somewhere more to read about it. You will learn that there is a pastel of different hardness/softness, and thus to lay it differently. There are oil pastels - she looks like a fatty wax crayons and the way it differs from dry pastels. Also in the shops You will see pastel pencils that allow you to work more subtly. On sale is a set of pastels for various purposes, for example, to paint portraits or landscapes. Sets these differ in Tsvetovat scheme. Work in pastels amazingly velvety, matte finish, usually smooth and soft color transitions. With pastel need to learn how to apply. It is best to secure a special tool, or the usual cheap hairspray, spraying it very gently and evenly, avoiding large drops on the figure. For pastels have a special paper. In this case, we draw on the Kraft this paper SOTI and not grainy, but sketches will suffice. So, today we will do a quick sketch pastel home sneakers! 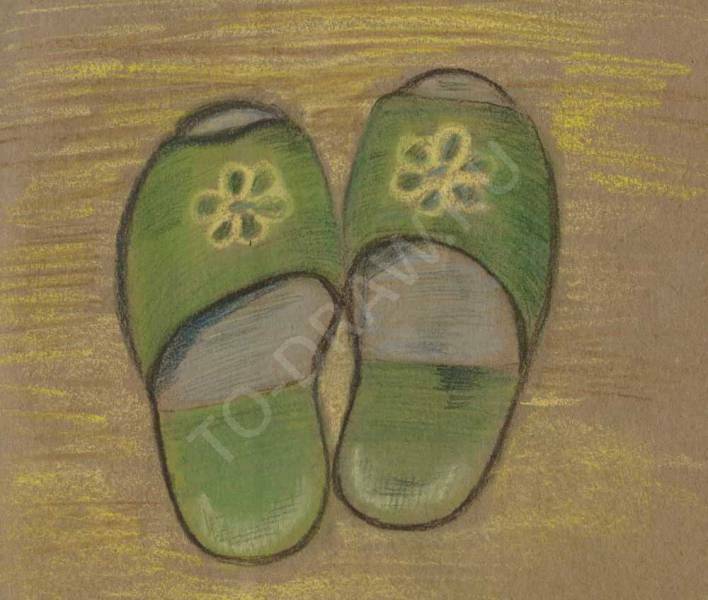 Draw gray pastel chalk and a preliminary sketch of Slippers. They stand on the floor and we look down on them. Draw the initial sketch of Slippers. The next step to Pokrywa our Slippers green - use different shades of green. Try to just work spots - some plot lighter, some darker, at the first floor immediately consider it. You can draw not very dense strokes, and then when ratuszowa to mix them. In the center draw a flower. Assurewave our greens (I do this with your finger, but there are special Ratuszowy). Add more dark green. Borders drawn in grey. Slippers our not-so-new note on the erased designated under heels - there is visible mesh fabric, I drew a simple pencil. For the shade inside of Slippers use grey and Indigo. On the background we apply long strokes of yellow, dark orange, brown. Feathering the first layer of pastel and further detail. Shaded background, which is parquet. For dark joints on the floor I used a simple pencil and brown pastel colors. Some see the picture of a tree. Don't forget to draw falling to the floor the shadow of sneakers. 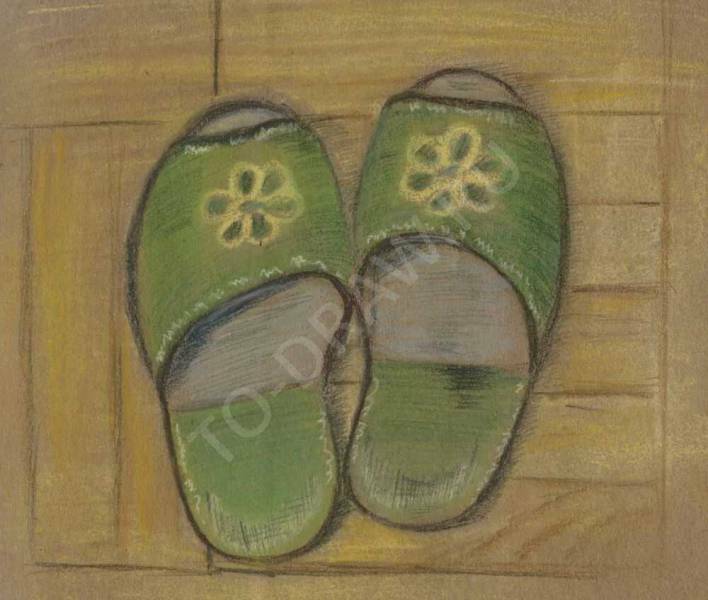 A touch of dark green Slippers I decided not to shade, they convey the texture of the fabric and worn sneakers, and visible strokes of a pencil on the inner surface. Add a bright glare on the front edging of Slippers. And the last item will be drawing (or rather hint) plating Kant light yellow accent stitching. I don't draw the exact shape of the stitch here is not worth this task), and show just in some places zigzag stitch. Feel free to experiment in working with any materials. In this sketch we pastels were restorefile and left visible shading, combined in the work of pastels and a pencil. And there are plenty of other variati!